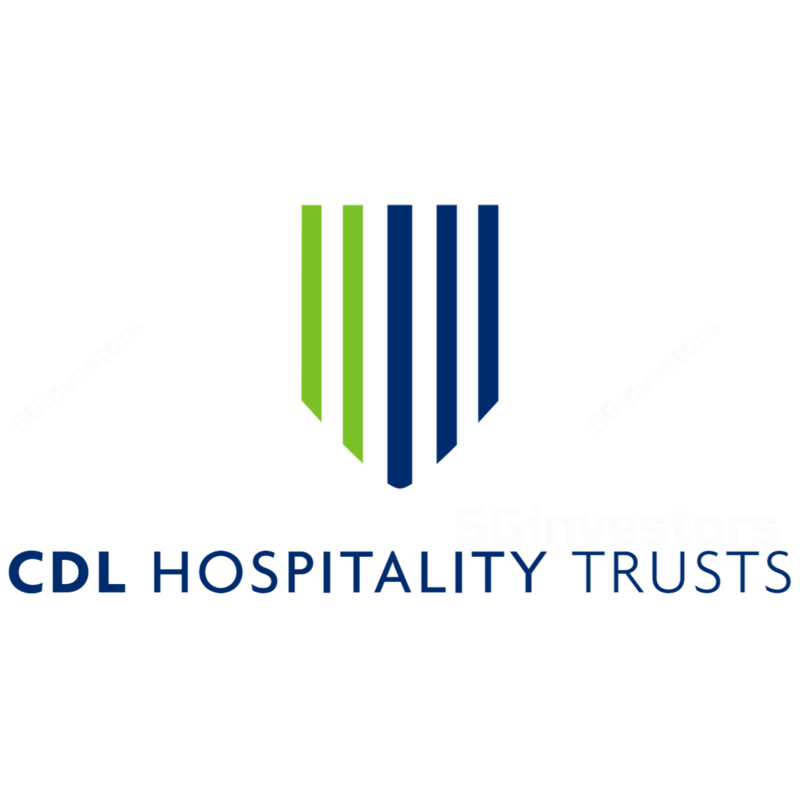 Given that CDL Hospitality Trust (CDREIT) is the bellwether hospitality stock, we believe it should continue to outperform during a cyclical upturn. Despite near-term supply fears, we believe its Singapore hotels could register a yoy improvement in 4QFY17F RevPAR, and 5% growth in FY18F. We see S$200m of acquisitions in FY18F (6% entry yield), lifting FY19F DPU by 5%. We trim our FY18F DPU by 2.8% to factor in weakness from Maldives, but raise our FY19F DPU by 3.6% to reflect Singapore's upturn and its inorganic growth there. Upgrade from Hold to ADD with a higher TP. Downside risks include slower-than-expected recovery in Singapore market and unfavourable acquisitions. From a “base-effect” perspective, we believe CDREIT’s quarterly revenue per available room (RevPAR) could be at an inflection – 4Q17F could be its first improvement in quarterly RevPAR in five years. As we expect occupancy to remain in the high-80%, we project a 5% yoy rise in average room rate (ARR) and corresponding 5% rise in RevPAR for FY18F; we see another 7% growth in FY19F RevPAR. 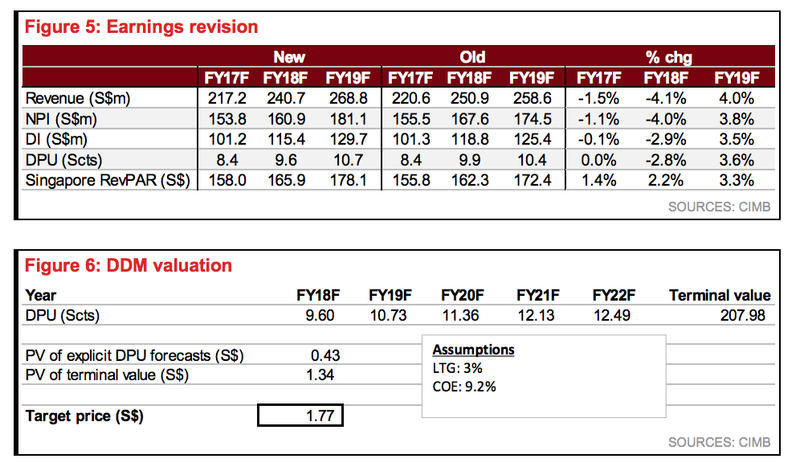 Note that FY19F ARR of S$198 would still be 14% lower than FY12's ARR of S$231, suggesting room for upside. Grand Millenium Auckland’s RevPAR surged 35% yoy in 9M17, while the change in rental structure to include more variable rent propelled 9M17 NPI by 80% yoy. We expect the positive performance to continue, given the healthy visitor arrivals and an increase in airline connectivity to the country. On 22 Dec 2017, CDREIT proposed the divestment of Mercure Brisbane and Ibis Brisbane for A$77m, representing an exit yield of 5.3% on the fixed rental of the hotels or 10% premium against their latest independent valuations. The divestment is slated to be completed in Jan 2018, and we have factored this into our model. The proceeds could be used to repay existing debts, while part of it could also be used to top-up the divestment effect in FY18F. It could also be channelled towards capital re-cycling. We temper our expectations for Maldives, expecting Angsana Velavaru to only earn the minimum rent of US$6m p.a. in FY17-18F. Further, the process to convert Dhevanafushi Maldives to a Raffles resort will lead to sub-optimal contribution until the re-branding exercise is completed in late-2018F. We also expect lower contributions from Japan given the rising competition in Tokyo’s economy hotel market. Lastly, we adjust our FX forecast to reflect a weaker GBP though underlying performance in UK has been stable. Given the manager’s desire to take advantage of the current attractive yield spread, and that it has re-calibrated its balance sheet in Jun 2017 with a rights issue, we believe there could be further acquisitions in FY18F. We estimate that CDREIT has a debt headroom of c.S$400m (assuming 40% cap of gearing). As such, we factor in S$200m worth of acquisitions at 6% entry NPI yield, which would contribute from FY19F onwards, lifting FY19F DPU by 5%. Target markets could include Europe, Japan and Australia. As CDREIT is the bellwether hospitality stock, we believe it would continue to outperform during the cyclical upturn. Hence, the upgrade to ADD. We reduce our FY18F DPU by 2.8% as we factor in the soft spots (Maldives, Japan and UK) and the divestment of two Australian assets. However, we raise our FY19F DPU by 3.6% on Singapore's hotel upcycle and potential acquisition growth. Our DDM-based TP also rises on slightly lower COE of 9.2% (previously 9.3%). Our TP implies 6.1% FY19F yield and 1.2x current P/BV.